An extensive body of literature is accumulating regarding animal studies with hyperpolarized gases. Most of these investigations have been concerned with (1) development of improved techniques for MR imaging and gas delivery [9,17,24,28-33], (2) safety issues , and (3) improved depiction of fine anatomic details. More recently, however, investigators are beginning to use these techniques in animal models of various pulmonary diseases such as emphysema and pulmonary embolism [34,35]. The following is a limited sampling of current work in this regard. Shattuck and colleagues used hyperpolarized 3He to produce isotropic three-dimensional MR images of lung in live laboratory animals at a spatial resolution of 0.013 mm3 . 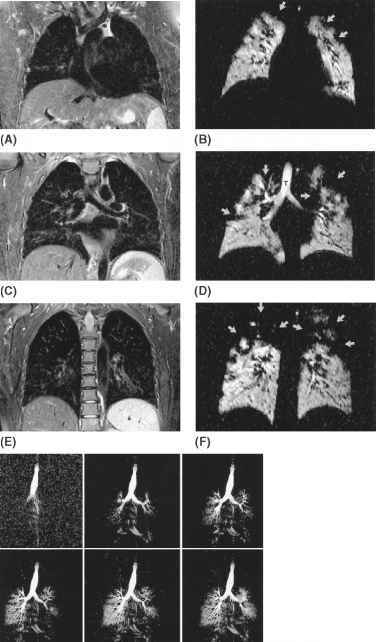 Viallon and colleagues developed techniques to produce functional magnetic resonance images of the lung in small animals at microscopic resolution using hyperpolarized 3He . These investigators, using spiral scan techniques, obtained a dynamic series (up to 40 images) of high-resolution 3He ventilation images in small animals using a single gas bolus . Moller and colleagues recently demonstrated the feasibility of three-dimensional magnetic resonance imaging of the guinea pig lung using hyperpolarized (HP) noble gases. They obtained high-quality images at a voxel size of 17 |L using 3He; airway structures down to the fifth or sixth generation were demonstrated (Fig. 2). Using 129Xe, the same investigators imaged guinea pig lungs with a voxel size of 40 | L. They concluded on the basis of their studies that in vivo visualization of alveolar clusters distal to respiratory bronchioles may be possible in guinea pig lungs using hyperpolarized gas MR microscopy of the lungs . Chen and colleagues, in a series of 3He experiments with guinea pigs, showed that larger flip angles (50-90°) destroy magnetization before it reaches the smaller airways. However, when moderate angles (20-40°) were used, airway branching down to the fourth and fifth orders were seen . This work suggests that selective airway imaging with hyperpolarized gases may be feasible. Cremillieux and colleagues showed that combined magnetic resonance lung ventilation and perfusion imaging was feasible in rat lungs . They used hyperpolarized 3He to assess ventilation and then performed proton MR imaging after contrast agent injection to assess pulmonary perfusion in an experimental rat model of pulmonary embolism. Chen and colleagues also investigated the ability of high-resolution hyperpolarized 3He MR imaging to diagnose early changes of emphysema in an animal model (elastase-treated rats) by measuring the apparent diffusion coefficient (ADC) of the gas following inhalation. Their data showed that the ADC was significantly larger in elastase-treated rats, indicating alveolar expansion—findings confirmed at histologic examination. These results suggest that measurement of the ADC of hyperpolarized 3He could be a valuable research tool and has potential application in the evaluation of early emphysema . Compared with conventional scintigraphic techniques for imaging pulmonary ventilation, hyperpolarized 3He-enhanced MR imaging offers several advantages: increased spatial resolution, ability to perform cross-sectional imaging, postprocessing capabilities (including three-dimensional analysis and quantification), and absence of ionizing radiation . Most work with hyperpolarized gas-enhanced MR imaging has involved patients with parenchymal lung diseases that affect ventilation, including cystic fibrosis (CF) , bronchiolitis obliterans syndrome (BOS) , and emphysema [27,39,40]. 1. Polarization is not delicate; the gas can be hand-carried over a long pathway to the imaging system. 2. Imaging is easily completed in a reasonable breath hold. 3. Very good images are achieved by inhalation of 0.75 to 1.0 L of 3He at 5 to 15% polarization (Fig. 1). 4. Helium-3 rapidly distributes to all regions of healthy lung (Fig. 1). 5. Helium-3 is restricted to the air spaces and does not penetrate the pleura, trachea, or mediastinum or into the blood vessels (Fig. 1). 6. Helium-3-enhanced MR images are remarkably consistent in quality and are reproducible. Figure 3 Hyperpolarized 3He enhanced MR imaging of healthy volunteer. (A-C). Coronal3 He-enhanced MR images obtained during a 15-sec breath hold, shown anterior (A) to posterior (C). Note that immediately following inhalation, gas rapidly distributes to all regions of healthy lung. Note also that the gas is restricted to airspaces and does not penetrate pleura, mediastinum, or into blood vessels. Gas is also identified within the trachea (T). Guenther et al. imaged asymptomatic smokers and compared the results to a group of healthy controls. They demonstrated that, although there was no significant difference in forced expiratory volume in 1 sec (FEVj) between the two groups, more ventilation defects were seen in the smoking group. These findings suggest that 3He MR imaging may be a sensitive means for measuring regional airflow abnormalities in patients with early lung disease due to smoking . Bronchiolitis obliterans syndrome, a manifestation of chronic rejection, is now the greatest limitation to long-term survival after lung transplantation . The syndrome manifests histologically with dense submucosal scar tissue that partially or totally obliterates the lumen of small bronchi and bronchioles. Patients with BOS typically present with worsening dyspnea and have physiologic evidence of progressive small-airway obstruction [45,46]. Histologic diagnosis is problematic in initial stages because transbronchial biopsy is often negative until disease is quite advanced [47,48]. Thus, BOS is often diagnosed clinically and graded using the ratio of the current FEV1, to the best posttrans-plant FEV1 (FEV1 ratio) . Although thin-section CT scanning has proven useful for evaluating lung transplant recipients with advanced BOS [50-56], CT scans can be normal in patients with early disease [57,58]. Because BOS may be at least partially reversible if diagnosed and treated early, the authors are investigating the ability of hyperpolarized 3He-enhanced MR imaging to diagnose BOS. Preliminary work has shown that ventilation defects on 3He-enhanced MR imaging are common in lung-transplant recipients and that these defects are more numerous and extensive in recipients with BOS than in those without BOS (Figs. 4 and 5) . These data also suggest that the extent of ventilation defects correlates with severity of pulmonary dysfunction as measured by the FEV1 ratio or by clinical BOS scores. Thus, the extent of ventilation defects seen on 3He MR images may correlate with the presence and severity of BOS in lung-transplant recipients. More data are needed, however, to determine if (1) ventilation defects seen in patients without clinical BOS are indicative of early disease; (2) 3He MR imaging is more sensitive than currently available diagnostic techniques such as thin-section CT scanning, transbronchial biopsy, or serial PFT evaluation; and (3) serial 3He MR examinations can identify patients with BOS before significant declines in pulmonary function occur. Imaging of emphysema, particularly in regard to distribution and severity, has become an important clinical concern with the advent of lung-volume-reduction surgery (LVRS). Preliminary data indicate that patients with heterogeneous disease show greater improvement, both subjectively and objectively, after LVRS than do patients with diffuse, homogeneous emphysema. Imaging research has thus focused on methods to quantify and categorize emphysema in patients being considered for LVRS. Thin-section CT scanning is currently considered the single best test for assessment, although important ancillary information can be gained from radionuclide ventilation/perfusion scintigraphy. MRI with hyperpolarized gases, by showing focal or diffuse ventilation defects in patients with emphysema [19,27,39,40], may also prove to be a valuable selection tool for LVRS. The technique may also prove useful for early detection of obstructive lung diseases and emphysema. Figure 4 Helium-3-enhanced MR imaging of 55-year-old man 1 year after unilateral right lung transplantation for emphysema. Patient is clinically well without significant reduction in FEV1 (BOS-0). (A) Coronal FSE proton MR image at anterior level for reference. (B) Coronal 3He-enhanced MR image obtained with 6-mm slice thickness and 2-mm gap during a 12-sec breath hold at same level as in A. Note homogeneous gas distribution in small right lung (allograft) and absence of ventilation in lower half of native emphysematous left lung (arrows). T = trachea. (C) Coronal FSE proton MR image at midthorax level for reference. (D) Coronal3 He-enhanced MR image obtained at same level as in C. Note few, scattered ventilation defects in allograft (arrows) and near-complete absence of ventilation in lower two-thirds of native emphysematous left lung. T = trachea. (E) Coronal FSE proton MR image at posterior level for reference. (F) Coronal 3He-enhanced MR image obtained at same level as in E. Note single wedge-shaped ventilation defect in allograft (arrow) and near-complete absence of ventilation in native emphysematous left lung. (G) Coronal 3He-enhanced MR images obtained every 1 sec at single midthorax level during inhalation. Note filling of right lung (allograft) first, with few scattered peripheral ventilation defects. Note complete absence of filling of native emphysematous left lower lung and delayed filling of left upper lung. sion or loss of polarization due to the T1 shortening effect of oxygen. Investigators have identified two types of defects in patients with air-flow obstruction: wedge shaped and oval [27,40]. Although pathologic correlation is lacking, these investigators have suggested that the wedge-shaped defects probably indicate obstruction at the level of the distal bronchi and that oval defects indicate bronchiolar-level obstruction. Gierada et al. studied a group of patients with severe emphysema who were being evaluated for possible LVRS. They used an echo-planar sequence to dynamically image the lungs after inhalation of 3He. They found delayed filling of portions of lung that were far larger than corresponding areas of emphysema on thin-section CT scans. However, because of the rapid loss of gas polarization during imaging, they were unable to image equilibrium or washout characteristics of the gas. Their data suggest that hyperpolarized gas-enhanced MR imaging, particularly with dynamic imaging, may be more sensitive to changes of early emphysema than thin-section CT. Figure 5 Helium-3-enhanced MR imaging of 26-year-old woman 2 years after bilateral lung transplantation for cystic fibrosis. Patient complains of mild dyspnea and has moderate reduction in FEV1 (BOS-1). (A) Coronal FSE proton MR image at anterior level for reference. (B) Coronal 3He-enhanced MR image obtained with 6-mm slice thickness and 2-mm gap during a 12-sec breath hold at same level as in A. Note generally homogeneous gas distribution, with a few, scattered, peripheral ventilation defects in both lungs (arrows). (C) Coronal FSE proton MR image at midthorax level for reference. (D) Coronal 3He enhanced MR image obtained at same level as in C. Note increasing size and number of ventilation defects (arrows). T = trachea. (E) Coronal FSE proton MR image at posterior level for reference. (F) Coronal 3He-enhanced MR image obtained at same level as in E. Note near-complete absence of ventilation in upper lung zones (arrows). (G) Coronal 3He-enhanced MR images obtained every 1 sec at single midthorax level during inhalation. Note delayed filling of left lung compared to right as well as peripheral ventilation defects in upper lungs. reason, scoring systems that monitor disease progression using chest radiography or thin-section CT scanning have been developed and applied. There is also concern, however, that chest radiographs or thin-section CT scanning may not accurately detect early disease . Detection of early lung changes in CF is critical because many protocols evaluating new therapies involve young children with minimal or no lung disease. Thus, the optimal imaging modality for grading disease progression in CF patients should provide both morphologic and functional information, should be very sensitive for early disease, and, because serial examinations are required, should minimize or eliminate radiation exposure. Preliminary work in patients with CF has shown that multiple areas of absent lung ventilation may be seen on 3He-enhanced MR images (Figs. 6 and 7) . These areas of absent ventilation range from wedge-shaped peripheral defects to entire lung zones. Combined scores based on the ventilation defects seen on 3He MR images and the morphologic changes (bronch-iectasis, mucus plugging, and peribronchial thickening) seen on proton MR images correlate well with clinical and radiographic assessments of disease severity. The severity of ventilation defects on 3He MR images is often much greater than would have been predicted based upon the morphologic changes seen on proton MR images. This finding suggests that 3He ventilation imaging may be more sensitive to the early changes of CF and may show abnormalities before morphologic changes are seen on chest radiographs or thin-section CT scans. Although these preliminary results are encouraging, further investigation in young patients with CF and minimal lung disease is necessary. Figure 6 Helium-3-enhanced MR imaging of 20-year-old man with cystic fibrosis. (A) Coronal FSE proton MR image at anterior level for reference. Note morphologic changes of upper lobe bronchiectasis and mucoid impaction as well as left upper lobe volume loss. (B) Coronal 3He-enhanced MR image obtained with 6-mm slice thickness and 2-mm gap during a 12-sec breath hold at same level as in A. Note multiple upper lobe ventilation defects corresponding to morphologic changes seen in A. (C) Coronal FSE proton MR image at midthorax level for reference. Note similar morphologic changes as seen in A as well as extensive mediastinal adenopathy. (D) Coronal 3He-enhanced MR image obtained at same level as in C shows corresponding ventilation defects. (E) Coronal FSE proton MR image at posterior level for reference. Note extensive bronchiectasis. (F) Coronal 3He-enhanced MR image obtained at same level as in E shows corresponding ventilation defects. Figure 7 Helium-3-enhanced MR imaging of 19-year-old woman with cystic fibrosis. (A) Coronal FSE proton MR image at midthorax level for reference. Note morphologic changes of upper lobe bronchiectasis and mucoid impaction. (B) Coronal 3He-enhanced MR image obtained with 6-mm slice thickness and 2-mm gap during a 12-sec breath hold at same level as in A. 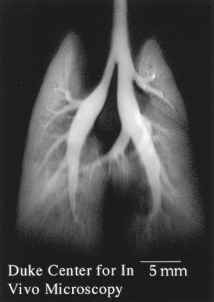 Note multiple large ventilation defects that are more extensive than would be expected based on morphologic abnomalities seen in A. (C) Coronal FSE proton MR image at posterior level for reference. Note morphologic changes of bronchiectasis and mucoid impaction. (D) Coronal 3He-enhanced MR image obtained at same level as in C. Note extensive ventilation defects out of proportion to morphologic abnomalities seen in C.
Hyperpolarized gas-enhanced MR imaging is a new, promising technique for high-resolution MR imaging of pulmonary airspaces. Helium-3 and 129Xe are the gases most commonly used for ventilation imaging. At present, the greatest clinical experience is with hyperpolarized 3He. This technique is limited, however, by the limited availability of 3He, its polarization requirements, and the need to tune the MR system to the resonant frequency of the gas. There is less clinical experience with 129Xe. Because morphologic and functional information is obtained, and radiation is not used, hyperpolarized gas-enhanced MR imaging may prove ideal for serially evaluating patients with a variety of lung diseases that affect pulmonary ventilation, such as cystic fibrosis, emphysema, asthma, or bronchiolitis obliterans syndrome in lung transplant recipients. 1. Bergin CJ, Glover GM, Pauly J. Magnetic resonance imaging of lung parenchyma. J Thorac Imag 1993; 8:12-17. 2. Bergin CJ, Glover GH, Pauly JM. Lung parenchyma: magnetic susceptibility in MR imaging. Radiology 1991; 180:845-848. 3. Bergin CJ, Noll DC, Pauly JM, Glover GH, Macovski A. MR imaging of lung parenchyma: a solution to susceptibility. Radiology 1992; 183:673-676. 4. Mayo JR. Magnetic resonance imaging of the chest: where we stand. Radiol Clin North Am 1994; 32:795-809. 5. 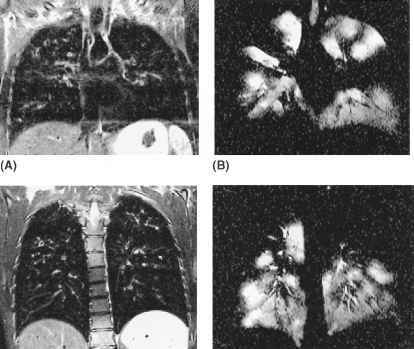 Hatabu H, Chen Q, Stock KW, Gefter WB, Itoh H. Fast magnetic resonance imaging of the lung. Eur J Radiol 1999; 29:114-132. 6. Albert MS, Cates GD, Driehuys B, et al. Biological magnetic resonance imaging using laser-polarized 129Xe. Nature 1994; 370:199-201. 7. Chen Q, Jakob PM, Griswold MA, Levin DL, Hatabu H, Edelman RR. Oxygen enhanced MR ventilation imaging of the lung. Magma 1998; 7:153-161. 8. Black RD, Middleton HL, Cates GD, et al. In vivo He-3 MR images of guinea pig lungs. Radiology 1996; 199:867-870. 9. Chen XJ, Chawla MS, Hedlund LW, Moller HE, MacFall JR, Johnson GA. MR microscopy of lung airways with hyperpolarized 3He. Magn Reson Med 1998; 39:79-84. 10. MacFall JR, Charles HC, Black RD, et al. Human lung air spaces: potential for MR imaging with hyperpolarized He-3. Radiology 1996; 200:553-558. 11. Middleton H, Black RD, Saam B, et al. MR imaging with hyperpolarized 3He gas. Magn Reson Med 1995; 33:271-275. Mugler JP III, Driehuys B, Brookeman JR, et al. MR imaging and spectroscopy using hyperpolarized 129Xe gas: preliminary human results. Magn Reson Med 1997; 37:809-815. Kauczor H, Surkau R, Roberts T. MRI using hyperpolarized noble gases. Eur J Radiol 1998; 8:820-827. Wolber J, Cherubini A, Leach MO, Bifone A. Hyperpolarized 129Xe NMR as a probe for blood oxygenation. Magn Reson Med 2000; 43:491-496. Wagshul ME, Button TM, Li HF, et al. In vivo MR imaging and spectroscopy using hyperpolarized 129Xe. Magn Reson Med 1996; 36:183-191. Ruppert K, Brookeman JR, Hagspiel KD, Driehuys B, Mugler JP III. NMR of hyperpolarized (129)Xe in the canine chest: spectral dynamics during a breath-hold. Nucl Magn Reson Biomed 2000; 13:220-228. Hedlund LW, Moller HE, Chen XJ, Chawla MS, Cofer GP, Johnson GA. Mixing oxygen with hyperpolarized (3)He for small-animal lung studies. Nucl Magn Reson Biomed 2000; 13:202-206. Eberle B, Weiler N, Markstaller K, et al. Analysis of intrapulmonary O(2) concentration by MR imaging of inhaled hyperpolarized helium-3. J Appl Physiol 1999; 87:2043-2052. Kauczor HU. Current issues in hyperpolarized gases in MRI: biomedical investigations and clinical applications [editorial]. Nucl Magn Reson Biomed 2000; 13: 173-175. Gentile TR, Jones GL, Thompson AK, et al. Demonstration of a compact compressor for application of metastability-exchange optical pumping of 3He to human lung imaging. Magn Reson Med 2000; 43:290-294. Gierada DS, Saam B, Yablonskiy D, Cooper JD, Lefrak SS, Conradi MS. Dynamic echo planar MR imaging of lung ventilation with hyperpolarized (3)He in normal subjects and patients with severe emphysema. Nucl Magn Reson Biomed 2000; 13:176-181. Yablonskiy DA, Gierada DS, Saam BT, et al. High speed dynamic MRI of lung ventilation with hyperpolarized 3He and EPI. Radiology 1998; 209(P):449-450. Schreiber WG, Weiler N, Kauczor HU, et al. [Ultrafast MRI of lung ventilation using hyperpolarized helium-3]. Rofo Fortschr Geb Rontgenstr Neuen Bildgeb Verfahr 2000; 172:129-133. Hedlund LW, Cofer GP, Owen SJ, Allan Johnson G. MR-compatible ventilator for small animals: computer-controlled ventilation for proton and noble gas imaging. Magn Reson Imaging 2000; 18:753-759. Ramirez MP, Sigaloff KC, Kubatina LV, Donahue MA, Venkatesh AK, Albert MS. Physiological response of rats to delivery of helium and xenon: implications for hyperpolarized noble gas imaging. Nucl Magn Reson Biomed 2000; 13:253264. Kauczor HU, Kreitner KF. MRI of the pulmonary parenchyma. Eur Radiol 1999; 9:1755-1764.
de Lange EE, Mugler JP III, Brookeman JR, et al. Lung air spaces: MR imaging evaluation with hyperpolarized 3He gas. Radiology 1999; 210:851-857. 28. Christman RA, Ailion DC, Case TA, et al. Comparison of calculated and experimental NMR spectral broadening for lung tissue. Magn Reson Med 1996; 35: 6-13. 29. Johnson GA, Cates G, Chen XJ, et al. Dynamics of magnetization in hyperpolarized gas MRI of the lung. Magn Reson Med 1997; 38:66-71. 30. Moller HE, Chen XJ, Chawla MS, Driehuys B, Hedlund LW, Johnson GA. Signal dynamics in magnetic resonance imaging of the lung with hyperpolarized noble gases. J Magn Reson 1998; 135:133-143. 31. Moller HE, Chen XJ, Chawla MS, et al. Sensitivity and resolution in 3D NMR microscopy of the lung with hyperpolarized noble gases. Magn Reson Med 1999; 41:800-808. 32. Shattuck MD, Gewalt SL, Glover GH, Hedlund LW, Johnson GA. MR microimaging of the lung using volume projection encoding. Magn Reson Med 1997; 38:938-942. 33. Viallon M, Cofer GP, Suddarth SA, et al. Functional MR microscopy of the lung using hyperpolarized 3He. Magn Reson Med 1999; 41:787-792. 34. Chen XJ, Hedlund LW, Moller HE, Chawla MS, Maronpot RR, Johnson GA. Detection of emphysema in rat lungs by using magnetic resonance measurements of 3He diffusion. Proc Natl Acad Sci USA 2000; 97:11478-11481. 35. Cremillieux Y, Berthezene Y, Humblot H, et al. A combined 1H perfusion/3He ventilation NMR study in rat lungs. Magn Reson Med 1999; 41:645-648. 36. Viallon M, Berthezene Y, Callot V, et al. Dynamic imaging of hyperpolarized (3)He distribution in rat lungs using interleaved-spiral scans. Nucl Magn Reson Biomed 2000; 13:207-213. 37. Donnelly LF, MacFall JR, McAdams HP, et al. Cystic fibrosis: combined hyperpolarized 3He-enhanced and conventional proton MR imaging in the lung—preliminary observations. Radiology 1999; 212:885-889. 38. 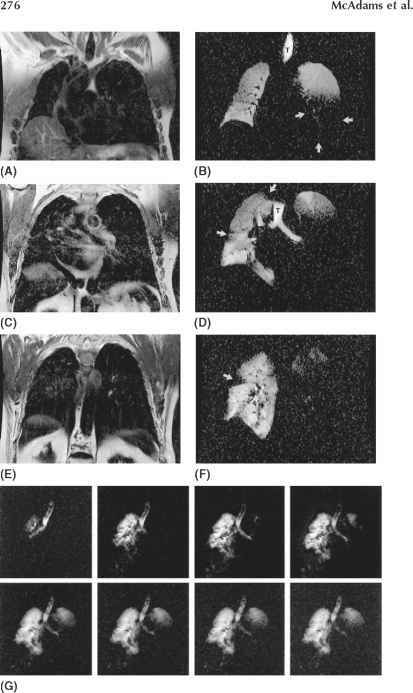 McAdams HP, Palmer SM, Donnelly LF, Charles HC, Tapson VF, MacFall JR. Hyperpolarized 3He-enhanced MR imaging of lung transplant recipients: preliminary results. Am J Roentgenol 1999; 173:955-959. 39. Kauczor HU, Hofmann D, Kreitner KF, et al. Normal and abnormal pulmonary ventilation: visualization at hyperpolarized He-3 MR imaging. Radiology 1996; 201:564-568. 40. Kauczor HU, Ebert M, Kreitner KF, et al. Imaging of the lungs using 3He MRI: preliminary clinical experience in 18 patients with and without lung disease. J Magn Reson Imag 1997; 7:538-543. 41. Guenther D, Eberle B, Hast J, et al. (3)He MRI in healthy volunteers: preliminary correlation with smoking history and lung volumes. Nucl Magn Reson Biomed 2000; 13:182-189. 42. Kroshus TJ, Kshettry VR, Savik K, John R, Hertz MI, Bolman RM, III. Risk factors for the development of bronchiolitis obliterans syndrome after lung transplantation. J Thorac Cardiovasc Surg 1997; 114:195-202. 43. Paradis I. Bronchiolitis obliterans: pathogenesis, prevention, and management. Am J Med Sci 1998; 315:161-178. 44. Sundaresan S. The impact of bronchiolitis obliterans on late morbidity and mortality after single and bilateral lung transplantation for pulmonary hypertension. Semin Thorac Cardiovasc Surg 1998; 10:152-159. 45. Scott JP, Peters SG, McDougall JC, Beck KC, Midthun DE. Posttransplantation physiologic features of the lung and obliterative bronchiolitis. Mayo Clin Proc 1997; 72:170-174. 46. Patterson GM, Wilson S, Whang JL, et al. Physiologic definitions of obliterative bronchiolitis in heart-lung and double lung transplantation: a comparison of the forced expiratory flow between 25% and 75% of the forced vital capacity and forced expiratory volume in one second. J Heart Lung Transplant 1996; 15:175181. 47. Cagle PT, Brown RW, Frost A, Kellar C, Yousem SA. Diagnosis of chronic lung transplant rejection by transbronchial biopsy. Mod Pathol 1995; 8:137-142. 48. Chamberlain D, Maurer J, Chaparro C, Idolor L. Evaluation of transbronchial lung biopsy specimens in the diagnosis of bronchiolitis obliterans after lung transplantation. J Heart Lung Transplant 1994; 13:963-971. 49. Cooper JD, Billingham M, Egan T, et al. A working formulation for the standardization of nomenclature and for clinical staging of chronic dysfunction in lung allografts. International Society for Heart and Lung Transplantation. J Heart Lung Transplant 1993; 12:713-716. 50. Ikonen T, Kivisaari L, Harjula AL, et al. Value of high-resolution computed tomography in routine evaluation of lung transplantation recipients during development of bronchiolitis obliterans syndrome. J Heart Lung Transplant 1996; 15: 587-595. 51. Ikonen T, Kivisaari L, Taskinen E, Piilonen A, Harjula AL. High-resolution CT in long-term follow-up after lung transplantation. Chest 1997; 111:370-376. 52. Lau DM, Siegel MJ, Hildebolt CF, Cohen AH. Bronchiolitis obliterans syndrome: thin-section CT diagnosis of obstructive changes in infants and young children after lung transplantation. Radiology 1998; 208:783-788. 53. Leung AN, Fisher K, Valentine V, et al. Bronchiolitis obliterans after lung transplantation: detection using expiratory HRCT. Chest 1998; 113:365-370. 54. Loubeyre P, Revel D, Delignette A, Loire R, Mornex JF. High-resolution computed tomographic findings associated with histologically diagnosed acute lung rejection in heart-lung transplant recipients. Chest 1995; 107:132-138. 55. Loubeyre P, Revel D, Delignette A, et al. Bronchiectasis detected with thin-section CT as a predictor of chronic lung allograft rejection [see comments]. Radiology 1995; 194:213-216. 56. Worthy SA, Park CS, Kim JS, Muller NL. Bronchiolitis obliterans after lung transplantation: high-resolution CT findings in 15 patients. Am J Roentgenol 1997; 169:673-677. 57. Lee ES, Gotway MB, Reddy GP, Golden JA, Keith FM, Webb WR. Early bron-chiolitis obliterans following lung transplantation: accuracy of expiratory thin-section CT for diagnosis. Radiology 2000; 216:472-477.
appearance on expiratory minimum intensity projection images. Can Assoc Radiol J 2000; 51:103-106. 59. Kauczor HU, Ebert M, Kreitner KF, et al. [The helium-3 MRT of pulmonary ventilation: the initial clinical applications]. Rofo Fortschr Geb Rontgenstr Neuen Bildgeb Verfahr 1997; 166:192-198. 60. Brasfield D, Hicks G, Soong S, Peters J, Tiller R. Evaluation of scoring system of the chest radiograph in cystic fibrosis: a collaborative study. Am J Roentgenol 1980; 134:1195-1198. 61. Bhalla M, Turcios N, Aponte V, et al. 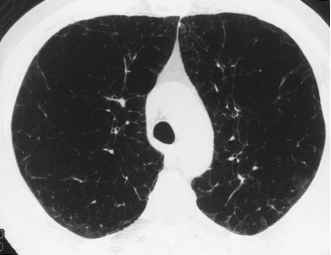 Cystic fibrosis: scoring system with thin-section CT. Radiology 1991; 179:783-788. 62. Donnelly LF, Gelfand MJ, Brody AS, Wilmott RW. Comparison between morphologic changes seen on high-resolution CT and regional pulmonary perfusion seen on SPECT in patients with cystic fibrosis. Pediatr Radiol 1997; 27:920925. 63. McAdams HP, Hatabu H, Donnelly LF, Chen Q, Tadamura E, MacFall JR. 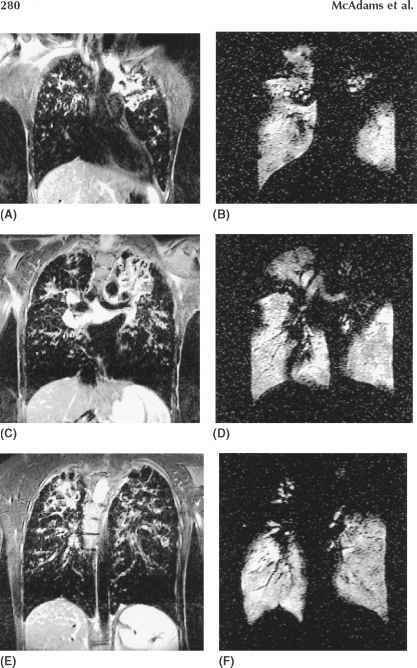 Novel techniques for MR imaging of pulmonary airspaces. Magn Reson Imaging Clin North Am 2000; 8:205-219.